and many owners are unaware of how serious these nasty little bugs can be. 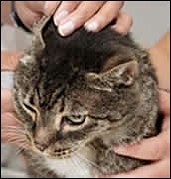 Mites are the cause of mange and the two most common mites that can affect cats are Otodectes Cynotis and Notoedres Cati. A type of fur mite called Cheyletiella can also infect cats, and, rarely, a mite called Demodex may do as well. Mite infestations typically make a cat very itchy and the parasites can be diagnosed by finding them with an ear swab, skin scraping or a microscropic examination of a tape impression. Otodectes Cynotis is the common ear mite and is also found on dogs - but they are not transmissible to humans. must feed off a dog or cat. The classic signs of ear mite infection are ear scratching, head shaking and a brown crusty discharge from the ears. If you have a cat that normally remains indoors and does not come into contact with other cats, it's reasonably easy to cure an infection. However, if you have pets who regularly go outside they have the potential for re-exposure to the problem. There are plenty of effective over-the-counter treatments for ear mites but it's advisable to pay a visit to your veterinarian for a professional diagnosis. Although ear mites are frequently found in cats they are not the only type of feline ear disease - bacteria, polyps, yeas and allergies can also affect the ears of cats. (MilbeMite Otic), Ivermectin (Acarexx) and Selamectin (Revolution) and they are very effective. When examining your cat or kitten for ear mites your vet will use an otoscope that looks deep into the ear and observe the parasites crawling in the ear canal. An examination may also be carried out with an ear swab under a microscope and observing live mites or mite eggs. Many people consider ear mites as not very serious, and some cat owners think cats with ear mites do not need to be treated. But this is definitely not the case and ear mites are extremely uncomfortable for a cat which has to endure constant itching and biting, as well as the noise of the mites in the ear canals. Cats with chronic ear mite infections may also develop inflammatory polyps in their ear canals and blood blisters on their earflaps - so ear mites must be taken very seriously and should be treated swiftly. You should also be aware of burrowing mites. These are uncommon but very troublesome for a cat or kitten. The parasite is normally found in the head and causes considerable irritation to the base of the ears. Burrowing mites can also cause hair loss and occasionally blood poisoning so you should contact your vet promptly to arrange a course of antibiotics.